Announcing the Makeit PRO-L | Makeit, Inc.
For over two years Makeit has been building machines and testing them in the hardest environments we can find, proving that durable industrial build quality and reliable ease-of-use can exist together in the desktop printing market. Now, after many, many upgrades and revisions we are ultimately proud to announce the all-new PRO-L. The PRO-L represents our most complete vision yet of what a true industrial desktop 3D printer is. 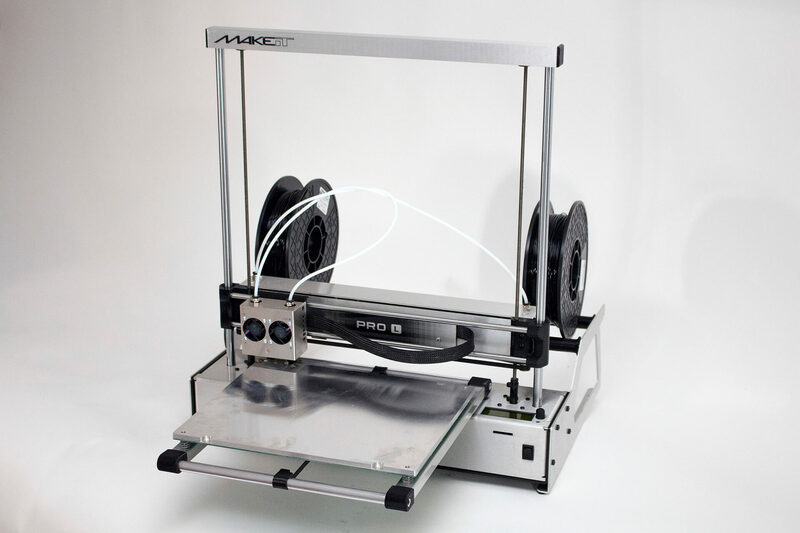 Continuing with the same great features offered in the original PRO like dual-extrusion, removable build plates, and on-the-fly tuning, the PRO-L introduces multitudes of functional and material enhancements. On top of faster printing, higher precision, enhanced durability, and a generous 10″ x 12″ x 13″ build volume, the PRO-L displays a beautiful aluminum finish and updated graphic scheme, making it equally at home in a design studio or a manufacturing plant. PRO-L test units are out across the country in the hands of trusted associates and product testers, and the first production units will be rolling out the door to their customers in less than two weeks. Stay tuned here for more information and full spec list for the PRO-L, or contact us here for preorder information.